Ryan Paredez of Planwise. He tells us you don’t have to stop going to Starbucks, but you might need to if you want to get that new car. Here’s more on how the site he blogs for can help you make that decision. What does Planwise offer to visitors who are looking to get a handle on debt and take control of their financial future? A lot of financial tools available today focus on transaction history, but most of us already know we spend too much on coffee and bagels every morning. Planwise is designed to help people focus on the future. We aren’t going to tell you to stop going to Starbucks, but we can show you how much cutting back on your morning coffee could save you by the end of the year. 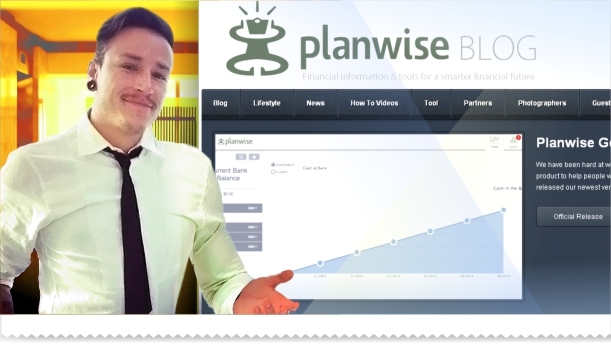 Planwiseallows people to model any of their major purchases, and see what the outlook is given their current income and monthly expenses. One of the most powerful things about Planwise is you can model multiple scenarios to see how they will impact each other in the future. If it doesn’t look like they’ll have enough money for a down payment on a car, they can decide whether to hold off a month or two on that purchase or cut another expense for a few months to make that plan happen sooner. The Planwise Tool plays a very important role in the design of the website. How and why was it developed? Our CEO, Vincent Turner has a background in finance as well as user interface and user experience (UI/UX). He wanted to make something that was visually appealing and simple to use, so we designed Planwise. You don’t need a degree in finance or have any tech background in order to use it. We are preparing to launch a new version of Planwise in the coming weeks and we are redesigning our site. We don’t want to have a bloated corporate website with tons of information. We want to keep it simple and direct. Planwise also has a blog section on the site. Were they launched at the same time as the tool and what blogs are popular? The blog came first. We publish weekly personal finance-related posts and anything that relates to the company. Currently the most-viewed post is one that talks about how you can partner with Planwise. The second-most-viewed post is one I wrote about a savings account. Another popular one I wrote is Have fun or save money. Friends can be really persuasive when they want you to come out, but you know you don’t have the money for it. Then out comes the credit card. Your blog posts have lots of information on personal finance and mortgage-related topics, including using apps to save money. Do you have a favorite money-saving app? A few years back when smartphones were still fairly new and banks didn’t have their own apps yet, I used a budgeting app where I had to enter in everything by hand – money in and money out. I’ve always been pretty good about knowing how much money I have though so I’ve never been too dependent on a third-party source. What are your top five tips for individuals looking to plan out their financial futures and get a handle on spending? Know how much you make and how much you spend. Live within your means. Your rent or mortgage should be no more than 30 percent of your income. Really evaluate your spending habits – are you spending your money wisely? I’m not saying not to have fun, but be aware of where your money is going. Save and plan. No one is going to do that for you. Do research. There are tons of financial blogs that can give you advice specific to your needs and tips that can help you. What cards are in your wallet and which do you use most and why? I currently have a Best Buy Rewards Zone card – but it’s maxed out. I missed a payment and got blasted with a bunch of interest fees. Major bummer. I have my Target debit card. It’s not a credit card because it’s linked to my bank account, but I get five percent back on every purchase. Then I have my U.S. Bank debit card, which I use the most. I have a U.S. Bank credit card, but I leave it in my room so I don’t use it.